First impressions are a BIG deal in the business world. Dirty tables at restaurants, obnoxious music at a store, and a sloppy display -- all are reasons potential customers do not take the leap to become actual customers. When it comes to entertainment and hospitality, impressions make a major difference in the customer's decision making process. If they have a complaint, why not just try your competitor? When it comes to making impressions, you want the physical appearance to impress your audience and any audio components to run smoothly and be invisible. Sound systems and lecterns are two great investments to ensure a great impression which will help increase profits in the long run. Some great uses for these suggested products are: hospitality industry, entertainment, banquet halls, corporate meetings, seminar and restaurants, conference rooms, country clubs and golfing resorts. Click here to see the list of products perfect for any entertainment or hospitality establishment. Sports are a growing part of society. There are so many reasons sports are great: they provide exercise, entertainment, community, and are a great money-maker. Many use sports as a tool to build character, build people skills and confidence while helping people out of tough circumstances. Events like marathons, tournaments, competitions, and conferences need the proper equipment to function. Event coordinators need to communicate with the competitors and fans for the event to run smoothly. 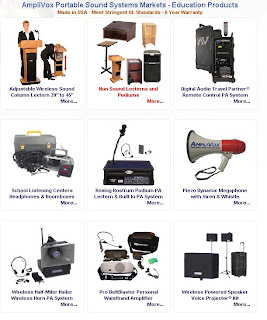 Sound systems, lecterns, and megaphones are all tools that can really boost your event. 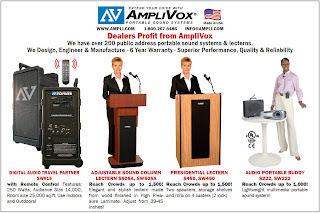 Amplivox provides high quality audio equipment and lecterns to many sports organizations and has a suggested page of products here. Amplivox recently released a video showing our relationship with a youth football program. Watch the video here! Most people do not realize how much technology and set up is required in a normal worship service. 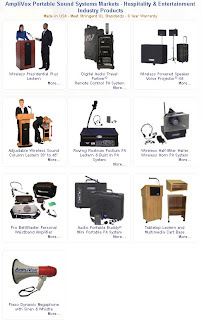 Microphones, pulpits, speaker systems, cords, and instruments are all needed for the proper flow of today's worship service. It is vital for places of worship to communicate effectively for their message to be heard, which is why the microphones, speakers, and other equipment is so necessary. A good portion of Amplivox's sales goes to customers desiring a great worship experience, and we have provided some recommendations on our site with some more commonly purchased products for the worship setting. We know that it can be an overwhelming task to start from scratch in setting up an audio system which is why we have made a document giving instructions and tips on how to effectively do just that which you can see by clicking here. One of Amplivox's main group of customers is the civil service community. We are kept safe by the police force, safe by the fire department, and the public works keeps us running. These services work tirelessly to keep our communities running and seek to ensure our freedom and safety. Pictured on the left is a list of recommended products we offer that are great assets to the civil service industry. Our Half-Mile Hailer wireless PA system is a great way to communicate and our Wireless Suond Cruiser Systems are great for squad cars and any vehicle that needs to announce vital information. Click here to see other recommended products for the law enforcement/civil service community. These days with many potential emergency situations, it is invaluable to have the right means to communicate. 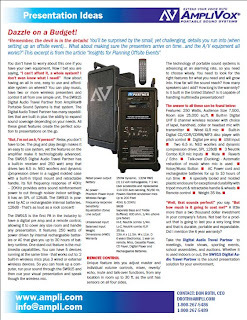 Check out how Amplivox products can help in emergency planning by clicking here. Flexibility is a desired attribute for just about everything these days. Multi-function cars are as popular now as they have ever been and technology has placed a MP3 player, computer, camera, and GPS system all in a cell phone. "Utility Players" are great assets to a baseball team because they can play so many positions. Coaches love them because they are like always having a wild card on the bench. Nobody wants to sacrifice any options when they could have the choice of an all-in-one. 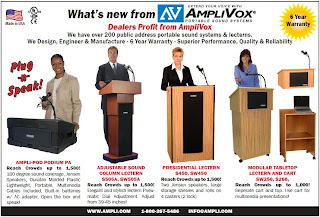 Amplivox has several products that are flexible like "Utility Player" and they can be used for a variety of purposes. The Digital Audio Travel Partner is one of those products; combining the latest in speaker and amplifier technology and providing the best sound along with the features that matter to you. Another "Utility Player" is the SW124 Wireless AmpliPod Podium PA which combines functionality, durability, and portability in this revolutionary table-top lectern. Our latest White Paper discusses some of our flexible lecterns and PA systems and how they can help grow profits. 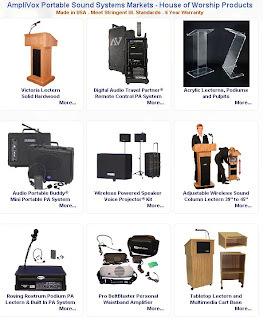 Click here to read how to "Effectively use PA/Lecterns to Grow Profits." Education is business. Schools are diverse organizations: many different events go on at schools like sports, assemblies and ceremonies, performing arts, and of course education. Employed are teachers, security guards, coaches, janitors, and administrators, just to name a few. With this diversity in event and function of a school, there are many events and uses lecterns, PA systems, and megaphones. Whether it be a pep rally, cross country meet, emergency situation, a debate tournament, or as an election site, a PA system or megaphone is essential in the life of a school. Since education is such a foundation element of our society, schools are not going anywhere anytime soon. Amplivox knows this and knows that schools want their money's worth as well; which is why our warranties are so great, lasting up to six years for selected products. Click here to see products that are great for schools. Budgets in this day and age are more important than ever. As writer William Feather said, "A budget tells us what we can't afford, but it doesn't keep us from buying it." It is often a struggle to squeeze all of your expenses into a budget and we at Amplivox know this. We have many products that give you the functionality and dependability you need at a price you can afford. Our latest White Paper offers tips and suggestions to fit your situation and your budget. It is always helpful to hear about a previous customer's opinion on a product. Our Testimonial Page documents dozens of experiences from customers from all over the world. The feedback pictured on the right describes how one of our mainstay products, the Half-Mile Hailer, has stood the test of time and been a great investment (find this testimony by the title Long Lasting Product Saves Money). "I am really impressed... the best customer service I have ever received on any product... ever!" 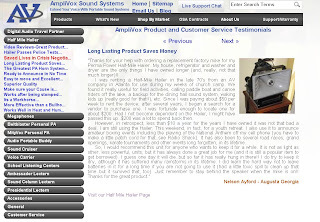 In preparing for this blog I had a fun time reading through stories of customers using Amplivox products for outdoor concerts, camps in Brazil, auctions, Rotary Clubs, and lifeguards, to name a few. Check out our Testimonial Page for yourself! 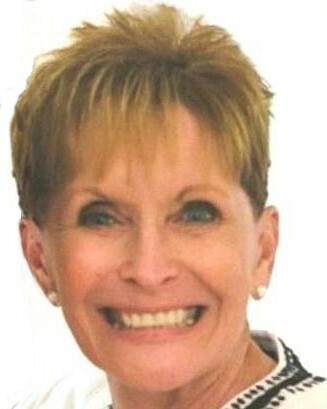 Check out another blog entry highlighting a customer testimonial by clicking on the link. Everybody loves getting a good deal on a product. Sometimes when I buy something for a great price, I want to tell everybody! Sales also make me consider buying things I wouldn't buy otherwise. AmpliVox has a sale page where you can get great deals on floor models and discontinued products. This is something you'll want to tell your friends about. Check out our sale page by clicking here! 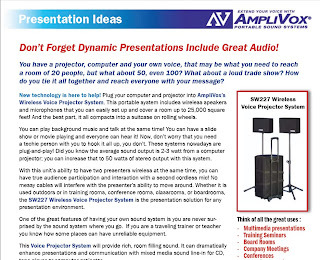 White Paper: Don't Forget Dynamic Presentations Include Great Audio! Do you think it is professional to start off meetings shouting "Hey, can you guys in the back hear me alright?" It is important to know that the entire audience will have no trouble hearing your message. That is why a dynamic audio system is so important to help you carry that message. 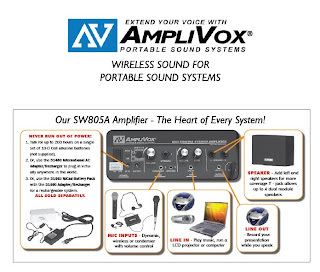 One such audio system is AmpliVox's SW227 Wireless Voice Projector System. 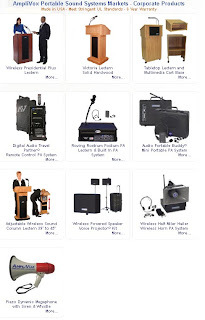 No need to be a "techie" because the system is designed for simple straightforward setup and operation, and all the cables you need for connecting to computers and projectors are provided for effortless amplification. You don't have to be a bodybuilder to lift this equipment either. The entire system weighs less than 40 pounds with pieces weighing no more than 15 lbs. making it extremely portable and easy to move, especially with the rolling carry case included. Don't you hate it when some people in the audience cannot hear while others almost go deaf because the speakers are too loud? Not sure what type of system would best solve this problem? 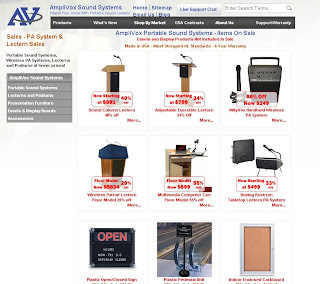 Amplivox's Wireless Sound for Portable Sound Systems Instructions and Tips gives you all of the information you need to create the perfect audio environment for presentations. 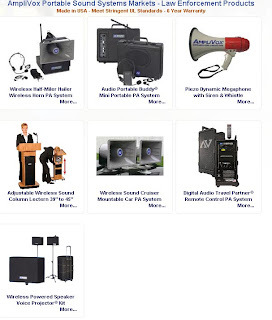 It takes you through the different types of microphones, speakers, and amplifiers and then gives instructions on how to set up the system to maximize gain and reduce interference and noise. It also give suggestions of how to ensure that everyone in the audience hears your presentation at a comfortable level. Click here to read the entire White Paper: Wireless Sound for Portable Sound Systems. We live in the Information Age. With the rapid advancements of the internet and communication technology, we now have access to limitless amounts of information instantaneously wherever we go. Information is key for businesses. It is important not only having the right information about the needs of a customer, but also to communicate vital information about products and services to the customer. Making sure that workers understand the goals and values of an organization is also important. Public Address Systems and Lecterns can be used to make sure the right information gets to the right people and are great tools to help increase profits. 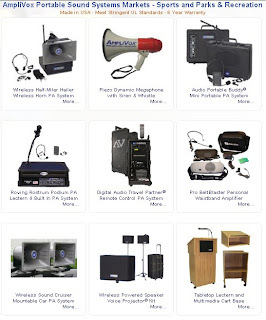 Some recommended uses for PA Systems and Lecterns are: Training Seminars, Board Rooms, Company Meetings, Conferences, Educational Settings, Talent Shows, and Trade Shows. 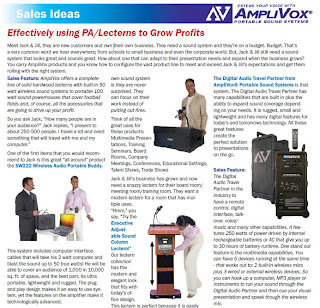 Click here to read our white paper "Growing Profits Using Public Address Systems and Lecterns" and learn more about how AmpliVox's PA Systems and Lecterns can help drive up profits.